384 pages - 81/2 x 11 - 1269 quality illustrations and photographs. This is an outstanding book that encompasses all of the improvements Tran Duy Ly has learned over his years of writing and publishing identification and price guides. No longer is he simply publishing identification guides - these separate, supplementary guides, updated frequently, will provide values for those interested in that - but books which will serve as reference books for years to come. In this volume, Ly draws on noted horological historians and writers to enhance the text. Chris Bailey and Thomas Spittler contribute important historical sections. The book begins with a thirteen-page section of introductory material of important tips for collecting clocks and watches that will be of interest to those just beginning to collect. Chris Bailey's twenty-page history, "The Ingrahams and their Clockmaking Firms," follows. Bailey, an expert on Ingraham history, provides an excellent brief account which is supplemented with numerous photographs showing the factory at various times as well as the products of the company. A listing of references for further reading; a list of Elias Ingraham's patents, and a detailed chronology of the history of the company are included. 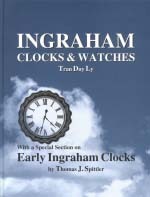 Tom Spittler's forty-four page history of, "Early Ingraham Clocks," gives the history of pre1860 Ingraham products made by the various Ingraham firms. Actual photographs of rare, early clocks illustrate the text. Of great importance is that not only are the clocks shown but their movements and labels are included as well. These two sections alone make the book an excellent value and the principal body of the text remains. Much of the remainder of the text consists of reproductions of Ingraham catalog illustrations, grouped by clock types, concluding with a section on Ingraham pocket and wristwatches. As with other Ly books, these catalog reproductions are supplemented by photographs of actual clocks and their movements. Almost hidden in the middle of the book is a ten-page section that is worth the cost of the book to those collecting American black mantel clocks, as many newer NAWCC members do. This ten page section, written by Chris Bailey, begins with a brief history of Ingraham black mantel clocks, and lists all the black mantel clocks made by Ingraham in alphabetical order by model name. For each model, the year it was introduced is given as well as the last year it was offered, along with the original cost. Also included are additional comments indicating, for example, when different case decorations existed for one model. To find such a listing in the middle of the book was incredible. From one who has spent many, many hours trying to determine the year a specific model of black mantel was made this section was a gold mine. It leaves one regretting that the same type of listing does not exist for all of the clock companies! Twenty-six pages of movement illustrations, many with detailed parts lists from Ingraham catalogs conclude the clock section of the book. A thirteen-page section on watches illustrates pocket and wristwatches made between 1915-1955. The detailed index that one has come to expect in a Ly book, and therefore takes for granted, concludes the volume. This book adds reference books to the publications Tran Duy Ly provides to the horological community. It was fascinating to watch the development of these books over the years and one can only salute the author for his efforts to continue to improve his product. By including the research of noted horologists to provide the historical data in the books Ly has contributed greatly to the dissemination of important, historical information on American clock companies. This is an important book that should become a part of every collector's library. While not in any way related to the Ingraham family of clockmakers who bear a name similar to mine, I have long had an interest in Ingraham clocks. When I received the draft of Tran Duy Ly's newest book, Ingraham Clocks & Watches, With a Special Section on Early Ingraham Clocks, my interest peaked and I was very pleased with what I read. I was immediately captivated with the excellent 20 page history of the Ingrahams and all their ventures into clockmaking by noted horologist Chris Bailey. That the Ingrahams and their many firms spanned the years 1828 to 1978 is astounding - 150 years! This history is augmented by superb illustrations of the Ingraham factories, a list of patents, and an excellent three page Ingraham chronology. Chris Bailey also presents a special section on Ingraham black mantle clocks. While these black mantles are now reasonably priced, I predict they will be among the most popular clocks of the 21st century. Now is the time to read about and understand these long underrated clocks while they are still reasonably priced. Tom Spittler provides a superb section on Early Ingraham Clocks. These 43 pages cover the efforts of the early Ingraham firms before 1860. None of these clocks were pictured in catalogs so all clocks presented are from actual photographs. The popular firms of Brewster & Ingrahams and E. & A. Ingrahams are well documented and the rare and valuable clocks produced by these firms, and others, are pictured and described in detail. The main part of the book is devoted to the Ingraham clocks manufactured after 1860. Where possible, Mr. Ly has inserted actual photographs to augment catalog illustrations to show these clocks and watches in detail. Ingraham was noted for its wrist watch and pocket watch production after 1912 and 13 pages are devoted to Ingraham watches. The section on movements is going to prove of benefit for repairmen. Movements illustrated range from 8-day pendulum , through alarm, fit-up, and watch to manual and self starting electric movements. The volume ends with a well prepared index by Sonya Spittler. Mr. Ly's other books about American clockmaking firms have set the standard for excellence in American horological literature. Starting with Seth Thomas, a work unequalled, and continuing with books on Ansonia, New Haven, Welch, Waterbury and Gilbert, this newest offering is again of the highest quality, typical of the Arlington Book Company. It contains 31 chapters and over 380 pages on different types of Ingraham clocks and watches and a supplementary price guide. If you collect American clocks, if you own an old Ingraham clock or watch you would like to know more about, or if you repair Ingraham clock or watch movements, this book is a must for you.